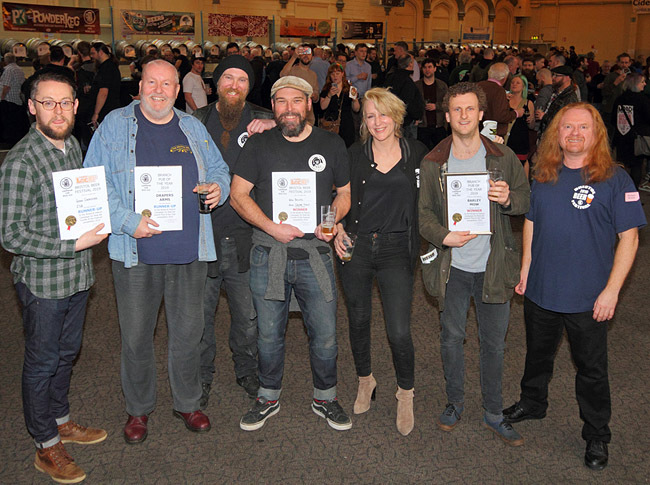 Barley Mow manager Harry Acfield (second from right) with the winning certificate for the Barley Mow following the presentation at the 2019 CAMRA Bristol Beer Festival.. The Bristol and District branch is pleased to announce that the Barley Mow 39 Barton Rd, St Philips, Bristol BS2 0LF is our 2019 branch Pub Of The Year. The runner-up is the Drapers Arms, 447 Gloucester Rd, Bristol BS7 8TZ. Serving excellent condition beers from the Bristol Beer Factory as well as from other breweries (both local and further afield) the Barley Mow also has a good reputation for it's food. The Barley Mow has been a runner-up several timers in the branch Pub Of The Year competition but this year has graduated from bridesmaid to bride with the Bristol & District branch acknowledging it as being the best pub in the branch area. It will now go forward to the regional stage of the competition to find the national CAMRA 2019 Pub Of The Year. A trip to present the official versions of the Pub Of The Year and LocAle of the festival certificates will be arranged in the near future. Click HERE to read about the branch POTY selection process.